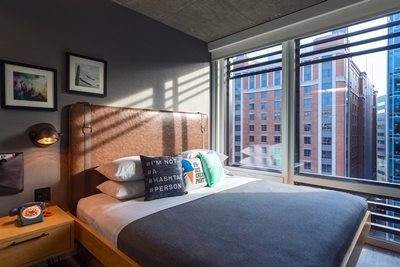 The experiential and spirited Moxy Hotels, part of Marriott International, has officially opened its doors to guests in Washington, DC aimed at the young and young at heart. The new Moxy D.C. will boldly reinvent the lifestyle hotel experience in the nation’s capital, positioning itself as the ultimate destination for engaging, smart and free-spirited travellers. Partially built within a historic building dating back to 1870, the former home to a Civil War Union General, Moxy D.C. is a hotel that embraces the city’s past with an eye to the future. The hotel’s interior design, led by Dash Design, is industrial chic; where style meets function throughout the 200-room, 14-story hotel situated on 1011 K Street NW in downtown DC. Polished concrete floors, exposed concrete columns, and open ceilings give way to a vibrant art-filled lobby, featuring original work by local D.C. artist Michael Crossett and a video art installation by international artist Rahul Jhad, winner of the hotel’s #BlankCanvas campaign competition. With more travellers spending time in common areas, guests can hang at their own pace in the lobby – on a couch with mobile device in hand or in take in a lively scene at the bar with beverage in hand: think living rooms with a bartender. The communal areas feature ample plug-ins for personal devices, a library zone to enjoy a quiet read, and the Moxy Digital Guestbook for streaming videos and pictures via Instagram. The NOW public space at Moxy D.C. is ignited with games – from table top to game tables to amp up the fun – and fun twists, like a mechanical toy horse that guests and visitors can actually ride. In addition to thoughtfully designed bedrooms and common spaces, the hotel features three distinct dining and drinking options, including the city’s first glass-enclosed rooftop bar. The splashy space is expected to open in Spring 2019 by the Baltimore-based Atlas Restaurant Group. Opening with the property, Moxy D.C. offers the brand’s signature 24/7 grab-and-go concept giving guests access to what they want, when they want it. Whether grabbing a quick bite with Moxy’s self-serve pick-ups or a 4-pack of local craft beers, guests will have all they need for a night on the town or a night cap in-room. The hotel will host the happiest of hours serving their signature naans with toppings and featuring a cool local DJ or a chill acupuncture happy hour. To learn more about Moxy D.C.’s upcoming events and to book a stay, please visit www.MoxyHotels.com.